How do you feel about Fabio Aru? Last week a reader wrote to me wondering why he couldn’t warm to Fabio Aru. It’s a common feeling. For this reader at least, his cycling played a part. I too have to confess to having supported Tom Dumoulin over the Italian. Most obviously, there’s the fact that Aru rides for Astana, no-one’s favourite team; a team who’ve been associated with several doping cases and who motored Vincenzo Nibali to disqualification in this very race. It’s important to note that up until now there haven’t been any real grounds for suspecting Aru of any kind of naughtiness, but he’s still in the same blue jersey. The Astana brand still has an impact. So while logically I have nothing against the man, in practice I pretty much always prefer whoever he’s up against. Seeing him win the Vuelta is therefore disappointing, but only in the sense that I’d rather someone else won. I don’t actually object to his victory in itself. I’m looking forward to seeing the highlights actually. Live coverage cut to an ad break at the exact moment Aru launched his decisive attack on the penultimate climb of the race. Upon returning to the action, there was a 20 second gap to Dumoulin. I wouldn’t have minded quite so much if approximately half the ads hadn’t been for Eurosport, the very channel I was trying to watch. 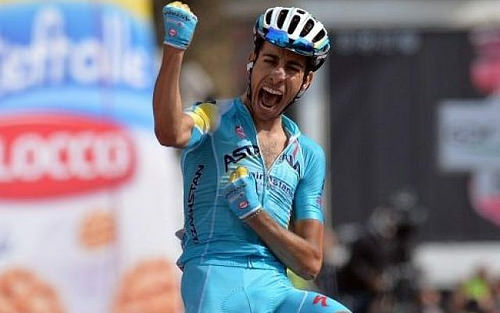 Astana do deserve credit for putting a plan together and executing it though. They had several riders in the day’s giant break and once Aru had that crucial gap, they sank back to help him out. At that point it was Dumoulin and the odd hanger-on from another team against an organised group of riders all working for the same goal up ahead. Aru was just tucked in behind them, saving strength for the final climb. Dumoulin never stood a chance. The gap between Dumoulin and those ahead of him just grew and grew. It was pretty harrowing actually; imagining how he must have been feeling as the seconds turned to minutes. When he crossed the line, he had dropped to sixth overall, his six second advantage over Aru transformed into a 4m36s deficit. Joaquim Rodriguez and Rafal Majka – who both finished in Aru’s group – moved up to second and third respectively. Majka was of course the second of my four or five riders to watch in 2015. Aru was the first. Perhaps irked by my unawareness of his existence prior to his Tour de France stage win earlier this year, Ruben Plaza was moved to offer a second striking display of his qualities. In many ways he picked the wrong day for an epic solo breakaway with all the excitement going on behind him, but even so, this was impressive stuff. After inexplicably opting to dump the rest of the break not even halfway through the stage, Plaza then spent the next 112km explaining his decision in no uncertain terms. We’re a firmly anti-Astana household too – so much so that despite having been glued to the Vuelta for the entire race my husband refused to watch yesterday’s final stage into Madrid. He said he’d rather watch an episode of Great British Bake Off than see Aru mount the podium (and I suspect Tom Dumoulin might have felt the same way). It is a very good example of the concept of branding. What would be minor indiscretions in other teams become indicative of something more sinister at Astana because they’ve already built a reputation as being a bit unsavoury. Similarly, riders like Fabio Aru, Vincenzo Nibali and Mikel Landa, who actually have no history of doping, are seen through excrement-tinted glasses by many fans. Landa is leaving, while Nibali and Aru are contracted for another year. It’ll be interesting to see what they do after that point. Personally, I think they would be stupid to decide to stay, regardless of what money is on offer. When I told MrMel that Landa was going to Sky he immediately wrinkled his nose, so the excrement analogy is very accurate!